It was -15F, the frost on the window next to my bed has become a thick coating of ice. But the sun is shining for the first time since I arrived. I had an opportunity to meet with Sergei, an evangelical leader whom I had not seen for many years. We met at a nice little café I had never noticed near the Kontraktova Metro (about a mile from Maidan). We exchanged a bit of history… both of us highly value the grounding in discipleship and the focus and emphasis on multiplication and reproducibility that we developed in our respective involvement with The Navigators (he had been involved with them during the Soviet Union days). It wasn’t long, though, before conversation turned to the events of the previous day, the passage of the infamous “amnesty for protestors” bill (which he, like others, saw as a “hostage-taking measure.”) What does this mean? – “It seems like now we hardly will be able to avoid big clashes.” [Editorial comment: Given that the time-frame of this bill expires in a matter of days (from the publication of this blog), we need to be praying – along with those standing in the gap – for a miraculous outpouring of grace… NOW!] 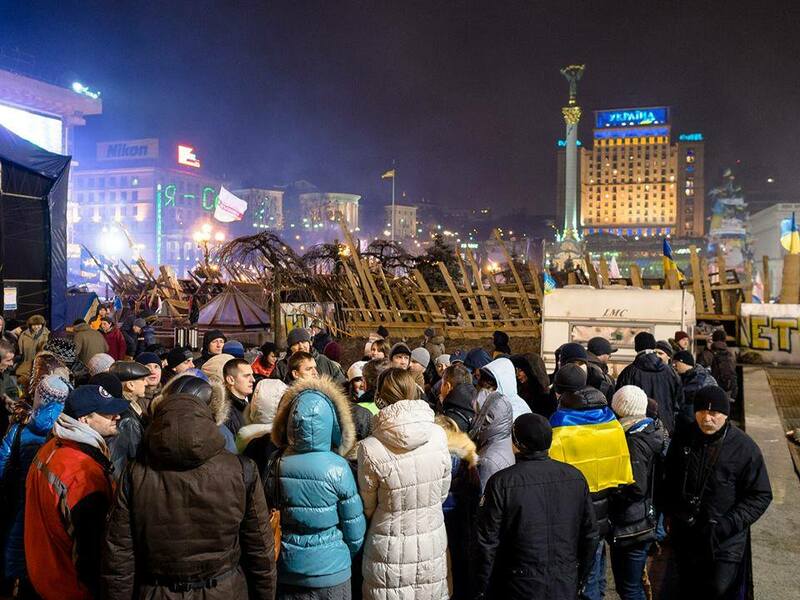 I still had not been to Maidan myself, but I had heard much. What, I asked, should I look for to discern the spiritual and missional significance of these events? It is prayer. The square is steeped in prayer. 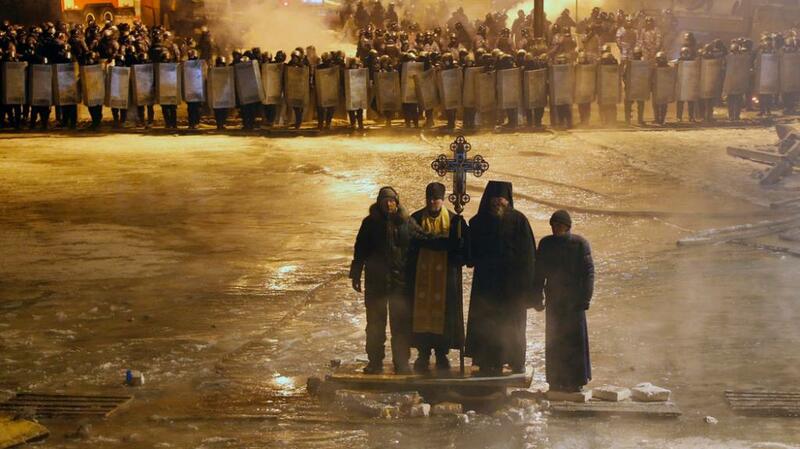 And these are prayers that are unified; the unity in prayer on Maidan is real. Your post on the prayer tent [a ministry with which he is well acquainted] was right on the mark – “A unified, spiritual and moral leadership to step into the current vacuum created by the moral collapse of the powers that be. 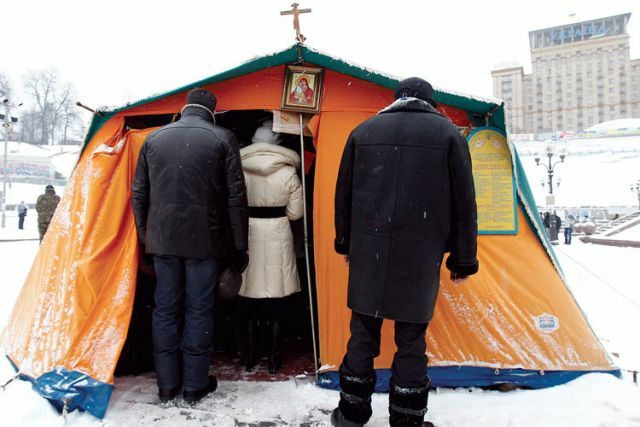 A renewed Ukraine that is moving toward Europe can be a blessing that could stimulate spiritual renewal throughout the continent.” Some people remain suspicious that this unity is barely “skin-deep,” that these various confessions can’t really be serious about seeking the Lord together… some feel that the prayers are not sincere, that they are self-serving or just political. But my friend assured me that he remains convinced that something unprecedented is happening. Why should that be, I asked. Is it like making steel – that the bonds cannot be forged apart from intense heat and pressure? Sergei seemed to like that metaphor. Maybe that is what it’s like. For years, for decades, there were people who were apart one from another. They had been apart, they had stayed apart, and everyone was fine with that. Now, at this time, all these people have come together, and found out how much they need each other. The stage on Maidan, in the first months of the demonstrations, was something of an entertainment venue, consistent with the quite romantic atmosphere that was in the air (as in the first 1:10 of this profound and disturbing video). The stage had been primarily filled with music that seemed designed to attract and entertain particularly the youth; popular singer Ruslana did a wonderful job, performing impromptu all through the night several times in order to keep the youth engaged. However the stage now has turned to prayer; music has been seldom heard in recent days. Every morning, the days “meeting” would begin with a prayer service. Over time, it moved from a daily discipline to hourly, and at times more often than that. So they are praying together – that’s seems to be a good thing. But on what is this “unity” based? There is unity being formed, and it is coming together on the basis of “values of righteousness,” and a willingness to stand for such values, even to suffer for them. 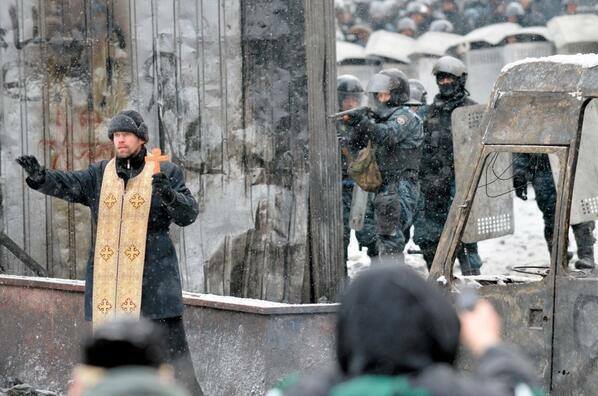 So what is it that the Orthodox on Maidan recognize that the Evangelicals could provide? The Orthodox have tremendous worship, they appreciate the value and power of ritual. And the Evangelicals bring a knowledge and a perception of God that the people need. On Epiphany (which, in Orthodoxy, celebrating Christ’s baptism, and which was also the day the violence escalated abruptly), the Evangelicals were drawn in. 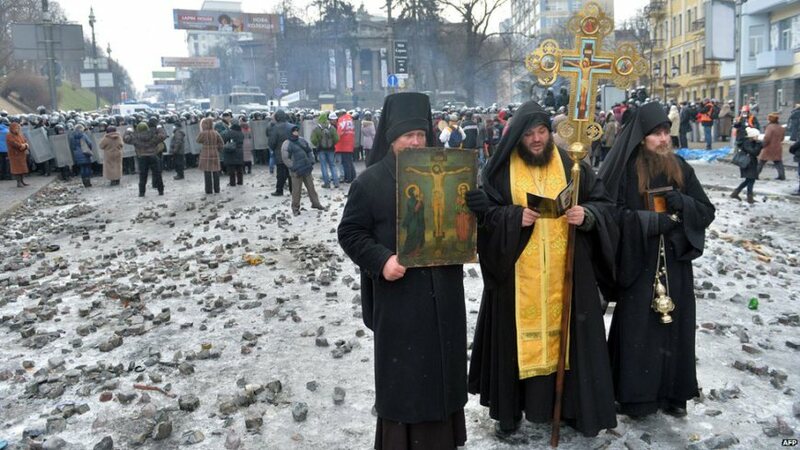 They were able to preach the Gospel from Maidan stage, to those who were “culturally Orthodox” to those who were “warriors.” We have heard hundreds of times Slava Ukraini (Glory to Ukraine! ), and the response Slava Geroyam (Glory to the Heroes!). Now we are hearing the enthusiastic cry, Slava to Jesus Christ! So, then, how is it that Christ can be glorified in and by his people in this day? Christ will be glorified in our obedient response to His call to be salt and light in the world. One woman told me, “Every time I go down to Maidan, I see a Christian that I know.” I think this does bring glory to the Lord. We glorify Him in our presence, which indicates His presence, by offering practical help. By “standing in the gap.” Sergei told me about the roughest days on Hrushevskogo. 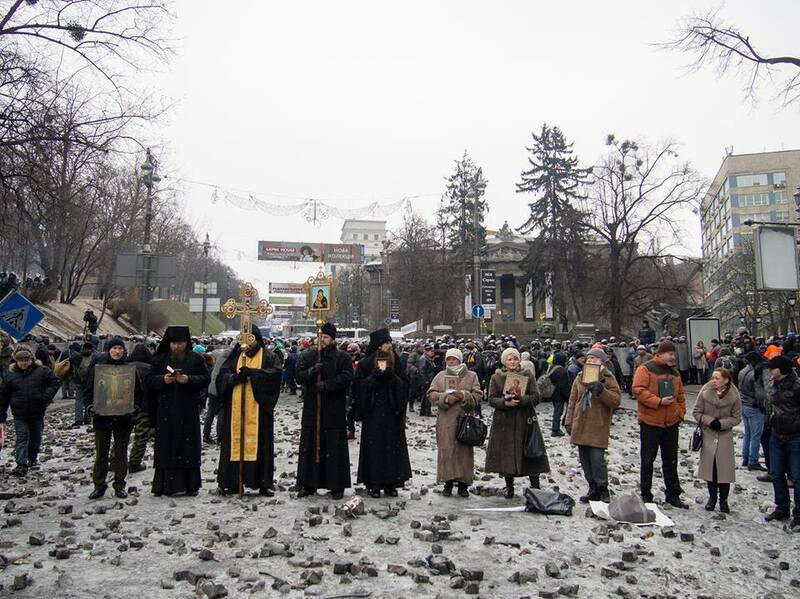 Throughout the height of the chaos, there were Orthodox and Protestant standing together, the former with their icons, the latter carrying their Bibles. They stayed there, praying, as a witness to the Prince of Peace and to stand between the parties who seemed ready to tear each other apart. As tensions rose, one of the pastors turned to the priest standing next to him and asked, “What will we do if they start shooting?” The priest, after a short silence, responded, almost without emotion, “We will pray.” There is indeed a wider significance to this battle which is far more than against “flesh and blood,” against leaders or parties. 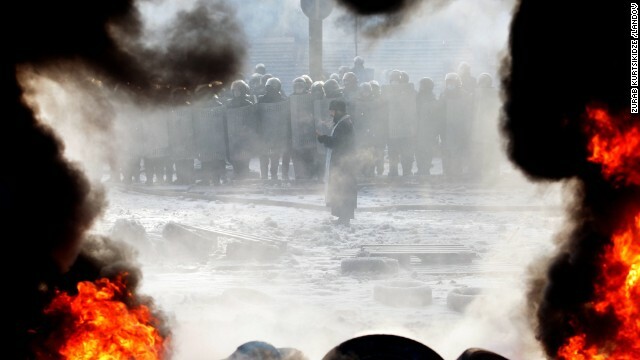 It is not just a battle for Ukraine, for its people or its future. It is not just about evil Ukrainian people (on whatever side) doing evil things. It is a question of God’s rule. God is using this to bring our attention to Himself. If we want to be able to grasp this we need to learn how to think more globally, and more historically as well. We need to continue to be moved to prayer. Until last night (when the “amnesty” went through), there seemed to be two possible outcomes – good and bad. Now it is very hard to believe in the “Happy End.” The bad end seems to be far more likely. It is reminiscent of the 1930’s when many believers suffered. Many were pacifists… and they were slaughtered, some abandoned their faith. In the final reckoning, God bringing glory to himself through the challenge to believers is more important than a “happy end.” So how can the global evangelical community be praying and supporting the Ukrainian believers at this time? We – individually and collectively – will need support as we may need to make some very serious and difficult decisions… If things turn bad, some will choose to leave; he has an open visa to US, but doesn’t believe it is right for him to flee – but he knows others will need to make their own decisions. Others will choose to stay: some to fight, some to bleed, some to battle, some to die. Others will just try to stay low and weather the storm. All believers need understanding and support as they face such decisions and their implications, and people to walk with them through such decisions. While the focus is on the (geo)political and economic facets of this story, what touched me most is the reality of believers coming together in unity to turn together to serve, witness and pray – for their nation, for the God of justice to be known today. I am humbled and honored to be considered by many of these folks “svoyi” (one of their own). To this day, the greatest personal compliment I’ve received is from young Ukrainians who have told me, “I didn’t think it was possible to love my country, but now I do. I learned that from you.” This country and it’s narod needs some lovin’ now. And lots of prayer. Please help.